The thing the Contenders brand is best known for is its Rookie Ticket Autographs. Over the past few years, variations and short prints have also entered the conversation. Even as it enters the college market, 2015 Panini Contenders Draft Football variations make their presence known. And although Panini has kept quiet on the exact details, it looks as though these variations don't need a lot of sleuthing skills to figure out which is which. Like 2014 Panini Contenders Football, the variation giveaway is on the front in the ticket portion of the card. Base Rookie Ticket Autographs have the player's jersey number as the Seat. 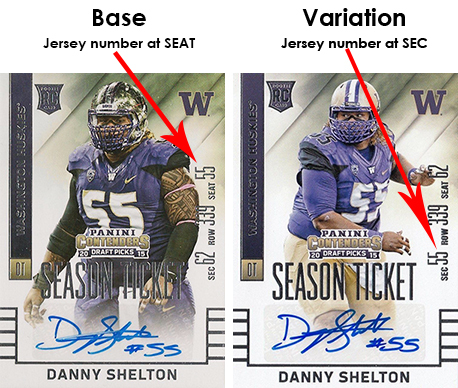 2015 Panini Contenders Draft Football variations have the jersey number switched to the Sec. So, yes, the player images differ but unless you're able to remember a lot of photos, the Seat/Sec method is much easier to keep tabs on. A total of 47 2015 Panini Contenders Draft College Ticket Autographs have variations. In addition to the base versions, these variations get the full parallel treatment as well. Below is a 2015 Panini Contenders Draft Football variations checklist. We've also listed the player's jersey number to help identify those that might not show in the photo. Panini hasn't released any specific short print information yet for both the regular College Ticket Autographs or the variations. Players' college jersey numbers are noted.